Source: The Economist, May 29 2010, p.28. 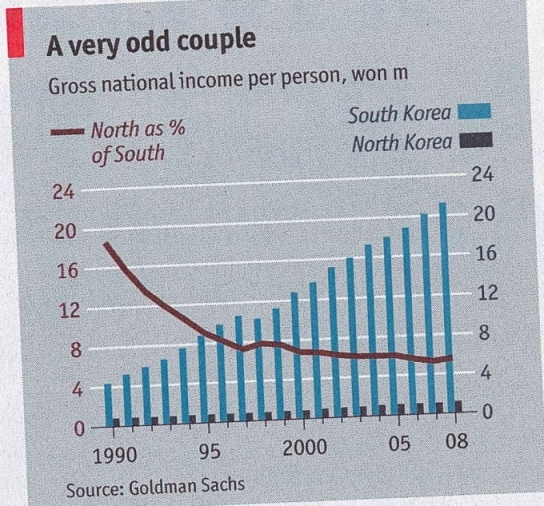 Note how Socialist North Korea's income has been precipitously dropping as a share of Capitalist South Korean income. It is merely about 6% of South Korean income now. Comment on Facebook: "What abt China's growth compared to G 8 countries??? N Korea is closer to dictatorship (with son following father) than socialism???" China has not been socialist in terms of its economic policies since 1979, well before India dismantled its license raj. It is not a capitalist country of course, since it doesn't have democracy and other freedoms. But mostly not socialist in its economic sphere. N.Korea is socialist in its economic model with the government doing everything (like India still does, although to a lesser extent than before), and no free enterprise. Dictatorship is a form of government, not a system of governance. You could have dictatorships with economic freedom (e.g. Singapore) even as you can have democracies without economic freedom (e.g. India). So that's not the nub of the argument, I think. This entry was posted in Bad ideas!, Liberty, Philosophy and tagged in Socialism. Sanjeev: I am going to shamelessly steal this for my blog – as a Guest Post by you – if you don't mind! You're most welcome to spread the word and help Indians discard their fascination for socialism. We need to bombard India with the truth. Only then will the dense fog created by Nehru in the minds of Indians lift. Keep up the good fight, Sanjeev. I stumbled on your blog looking for a graph that compares the correlation of measures of Socialism (central economic planning, publicly held means of production, etc) versus measures of corruption in government. Maybe you can point me to something. By the way, looking forward to soon having our second Indian-American governor here in the American Old South. Our small numbers of Indian-Americans are not only excelling, but also fitting in here in a way that suggests some high degree of personal and cultural affinity, for which I can personally vouch. It's also helpful for us to help dispel out-dated images of the South as racist or anti-immigrant. So keep sending your best and brightest over here. Dear JG, you might consider reading my book, “Breaking Free of Nehru”, particularly the more general chapters which discuss the failures of socialism and point out the advantages of a free society. The book is best downloaded from http://bfn.sabhlokcity.com/. And yes, India-Americans have tended to be some of the brightest among Indians, the refugees of socialist India. That outflow has reduced as India’s policies have become more free. But there’s a long way to go. In my vision, I will not rest till India becomes MORE free than USA (which has significant blockages on freedom). I aim ONLY for the day when Americans will line up outside the Indian embassy in Washington, seeking permanent residency visas in India. Till that day, I’m afraid I can’t see my work as having been finished. Sorry, Jason, I seem to have given you a new name after reading your email address and missing your name (somehow WordPress doesn't present the info completely to the owner of a blog! ).